Reddit a very popular social news community site finally launched its first official Reddit app for both Android and iOS devices and the app is now available for download for both the Android and iOS devices on the Play Store. The new official app was already in development, as we heard about it first when the company teased about its new app back in December 2015 and just before that somewhere around 2014, the company has also posted a job listing looking for someone to get its work done for their app. Since December 2015, the company also started testing the Beta version of its new app. So what’s the new feature Reddit has brought in its new launched app, below we have listed 6 best features of the newly launched Reddit app for Android and iOS. 1- Browse all – The new Reddit app allows its users to browse and search for the news which interest them most while on the go. No matter where you are,, you can easily brows news from anywhere even from your office restroom. 2 – Communities – With the new Official Reddit app you can search for the new communities based on the topics and your interest. 3- Express yourself – The new app also allows you to make new comments and can submit them to let others read your comment, you can also add images, links, and stories to better express your comments. 4 – Customize Reddit – With the new Reddit app you can also customize you’re your Reddit with different type of themes which also includes (Night theme). 5 – Compact and Card view – The also comes with two different Compact and Card view feature, which allows you to view the news and stories on the app either in compact view or card view. 6 – Stay Updated – Finally the last feature includes the overall performance of the app. With the new Reddit app Reddit user will now be able to stay up to date including with their inbox, messages, comment replies, post replies, and mentions. With the new Official app the company aims to provide a fast app experience for its users which have over 200 million its users worldwide. 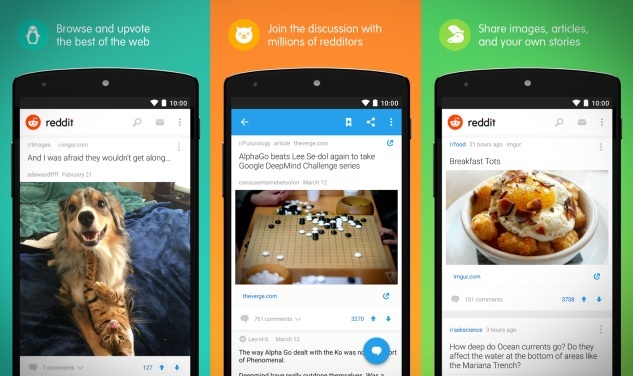 Building our first Android Reddit app is a no-brainer for us. Many core Redditors are Android users and it is important for us to deliver an official app experience that makes us proud. Said Alex Le–I VP of Consumer Product at Reddit. Alex also hinted about more updates to come in near future with many new features to the app.